We’ve had a fun summer collaborating with the Pan Am Path folks. In June we hosted a full week of guided tours along the waterfront and our exciting TALKING TORONTO TREATIES event. Now, we’re helping with the Grand Finale of the 14-week-long Pan Am Path ART RELAY. 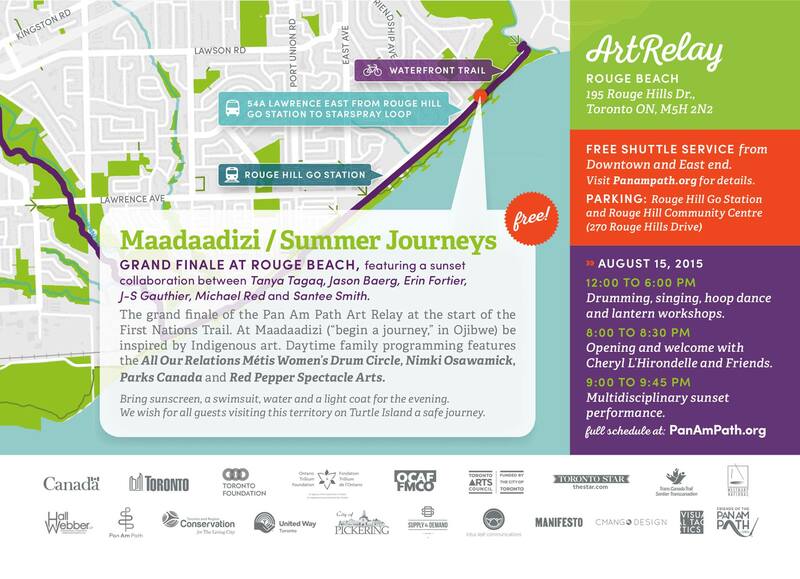 We’re offering free bus shuttles on Saturday to the Grand Finale event at beautiful Rouge Beach, where the Rouge River meets Lake Ontario (Kanadario). A full afternoon of family entertainments wil be followed by a stunning evening presentation. Please join us for a wonderful celebration of Indigenous arts and the natural beauty of a historic place. See details below about how to book seats on one of our 7 free bus shuttles leaving the Native Centre Saturday afternoon, Aug. 15. One of our tour guides will share Tkaronto stories with you on the trip to Rouge Beach. The featured sunset event, ‘The Great Chief Star’ is an original 45 minute journey into Indigenous cosmology. This original work is led by visual artist Jason Baerg and includes Santee Smith, Erin Fortier, J-S Gauthier, Michael Red and Tanya Tagaq on a futuristic mission to heal water. Afternoon family activities include the All Our Relations Métis Women’s Drum Circle, Nimkii Osawamick and hoop dancing, Friends of the Rouge Watershed, Parks Canada Environmental talks and Lantern Making with Red Pepper Spectacle Arts. Culinary arts by: Tea N Bannock. FREE. Spend the day at the Beach. Bring sunscreen, a swimsuit, water and a light coat for the evening. Light your lantern creation and be a part of the Sunset Performance! 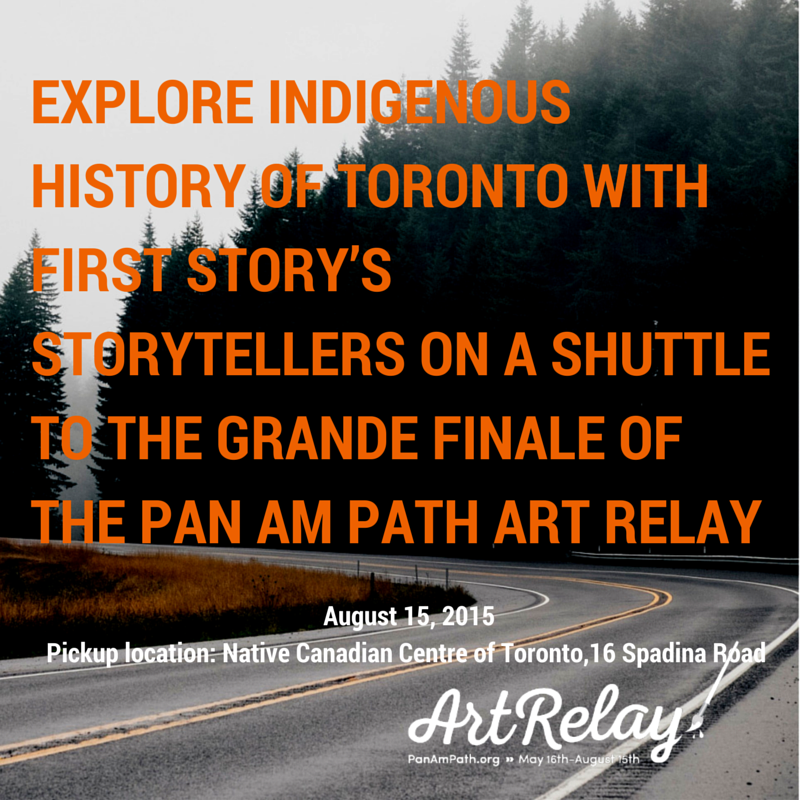 Explore the Indigenous history of Tkaronto with First Story’s storytellers on a FREE shuttle bus to the event. Free tour shuttle service (buses depart every hour) from 1pm to 7pm. There will be return shuttle buses leaving Rouge Beach between 10:15pm-11pm. 9:00 to 9:45 PM – “The Great Chief Star” ~ Featured Sunset Presentation featuring Tanya Tagaq and Santee Smith.